French oysters. Aged to perfection. 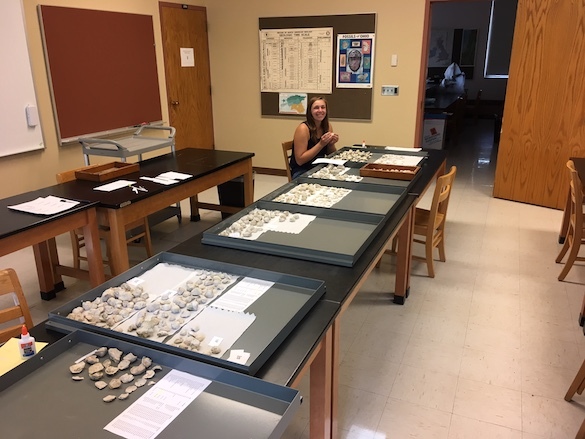 Wooster, Ohio — After our glorious fieldwork in France earlier this month, the Campanian (Upper Cretaceous) oysters Macy Conrad (’18), Paul Taylor (Natural History Museum, London), and I collected are now in our cozy Wooster Paleontology Lab. Now the less glamorous work begins: washing, sorting and labeling the specimens. Macy is shown at work with the collection arranged by localities. This part of the work requires very low-tech equipment: scissors, paper, and water-soluble white glue. Generations of Wooster students know this procedure. Every specimen must be labelled with a number indicating its locality, even if we have hundreds of them. Paleontologists worry a lot about losing the context of a specimen, so we are obsessive about labelling. 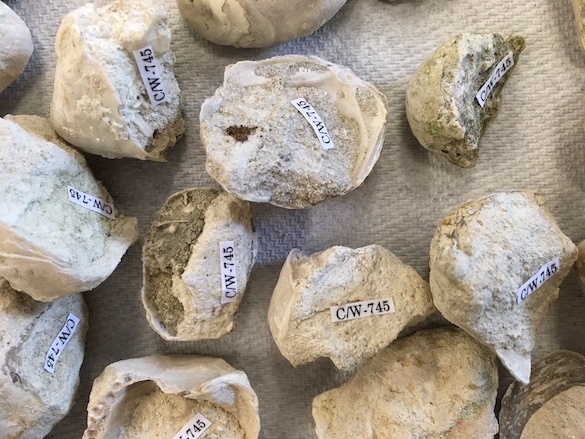 First we give a C/W code to each locality, print the numbers by the hundreds, cut them out, and then glue them to appropriate places on each fossil. 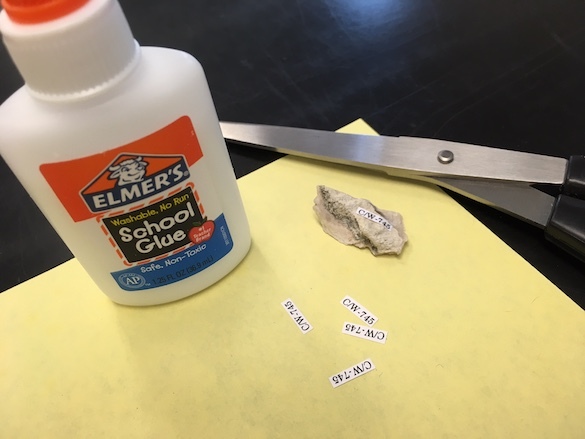 White glue is great because it is easy to use, non-toxic, and it dissolves in water in case we need to remove or change a label. I learned this simple process in graduate school. 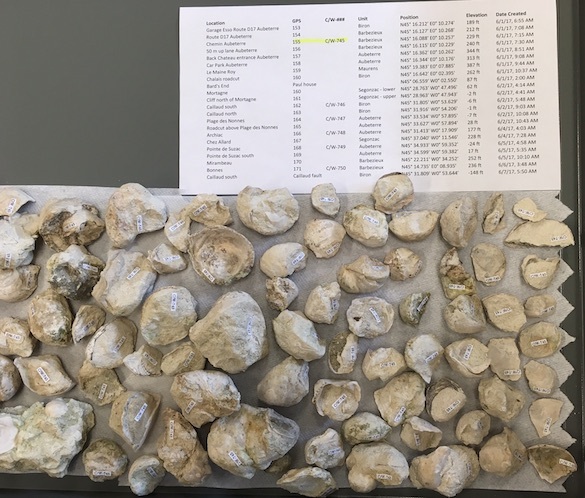 Here are some fossil oysters with our coding sheet above. A close-up of labeled specimens. We place the labels on matrix stuck to the fossil if possible. 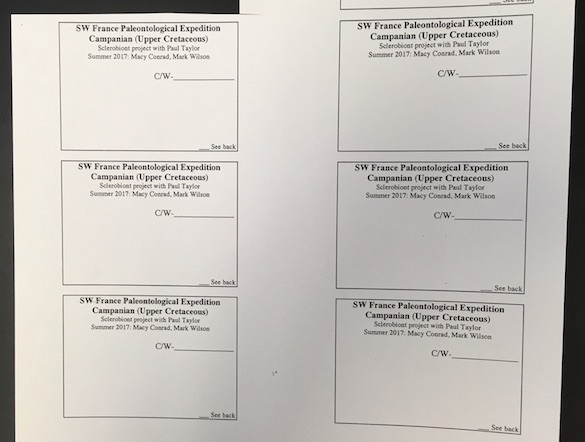 These are the customized tags we’ll eventually fill out for each specimen recording our observations of the sclerobionts (hard-substrate dwellers like encrusters and borings). This will keep Macy and me busy for a long time. It’s not dramatic work, but we thought you might like to see all aspects of paleontological research through this project. More to come! Day 3 consisted of Team Alaska exploring Juneau the way a tourist might. The group roamed around the downtown area stopping at quaint book stores, trading posts, and the Alaska State Museum. 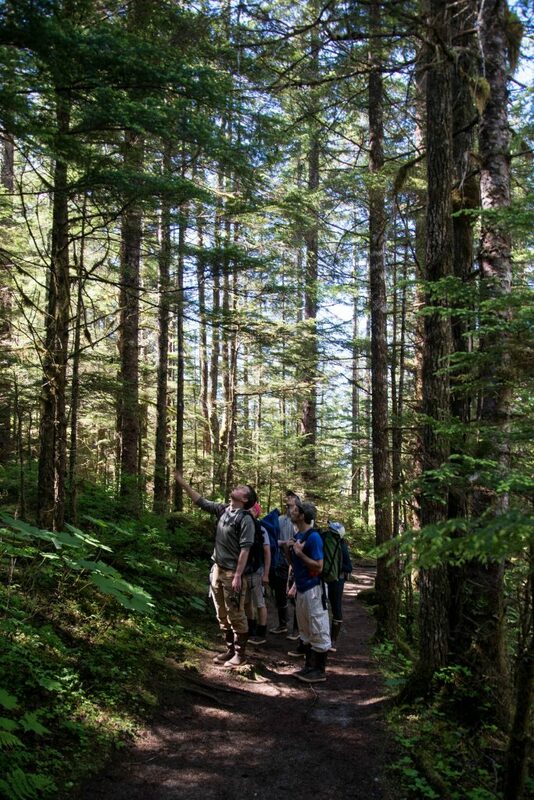 This allowed the team to relax their aching feet and gain a new perspective of the city and borough of Juneau. After visiting the museum, the team gained a deeper appreciation for Alaska’s native cultures and complex history. 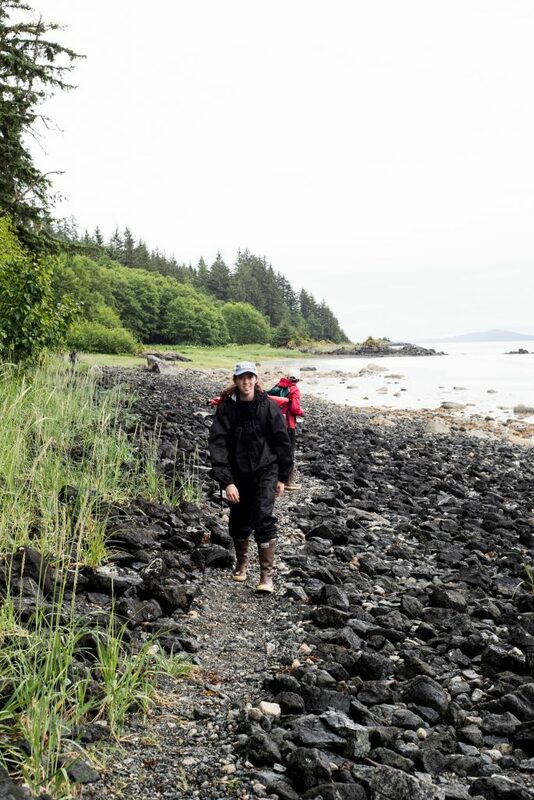 On day 4, Team Alaska conquered Bridget Cove, led by local forest ecologist and conservationist John Krapek. In order to get to the site, the team hiked over a mile of steep terrain covered by a large and spinous plant called Devil’s club. 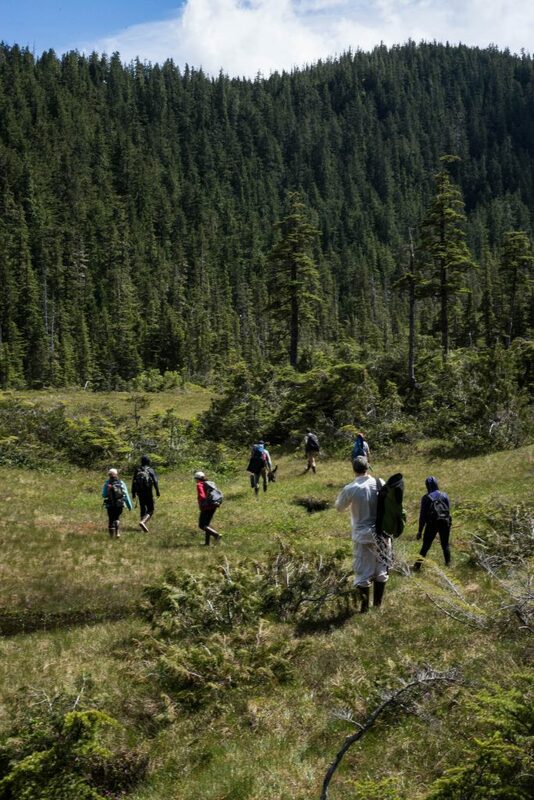 The team was able to collect a plethora of samples including that of yellow-cedar and western hemlock. 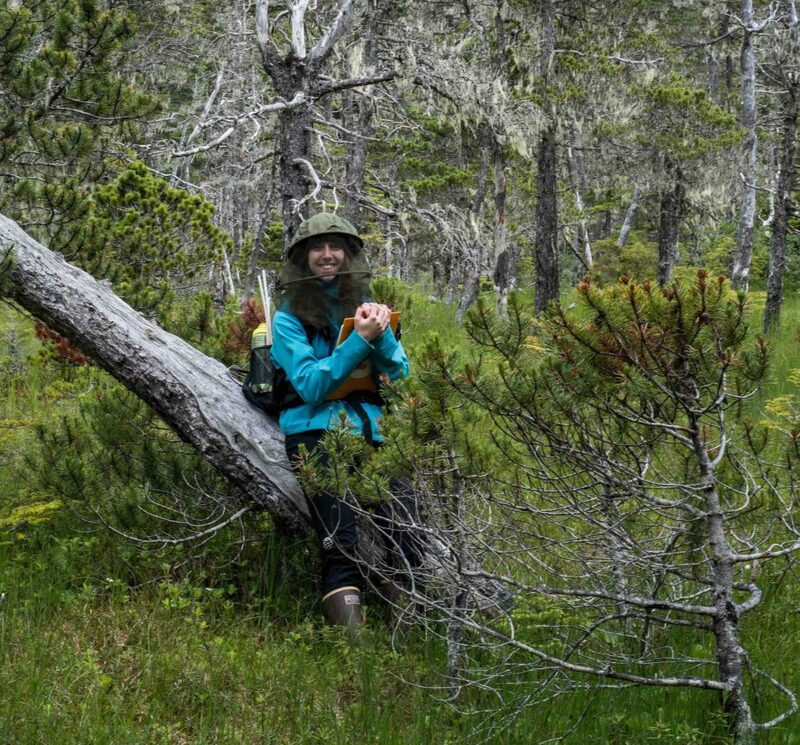 After collecting the samples, the team took a lunch break and enjoyed a nearby muskeg. 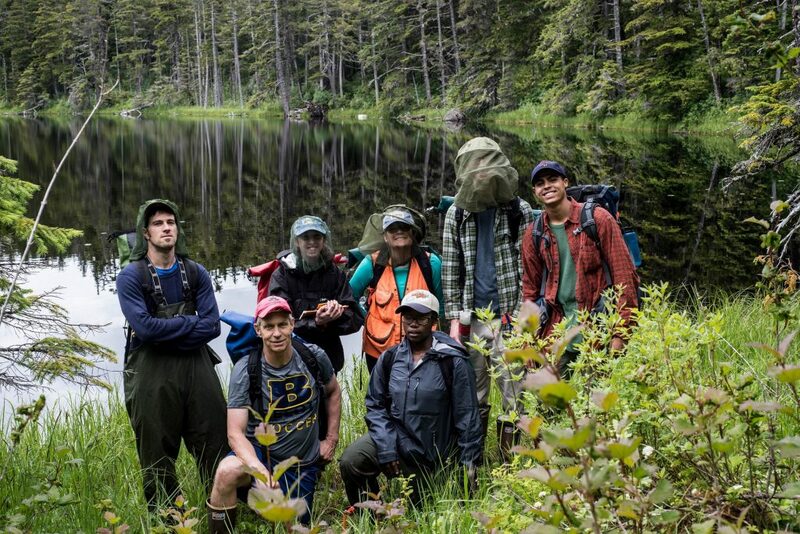 Finally, Team Alaska descended the slippery and densely vegetated trail, which was marked only by their previous footsteps. We wish Team Utah the best of luck braving triple digit weather, excited to meet back in Ohio in the coming days! The group smiles upwards as Jesse snaps a quick picture. 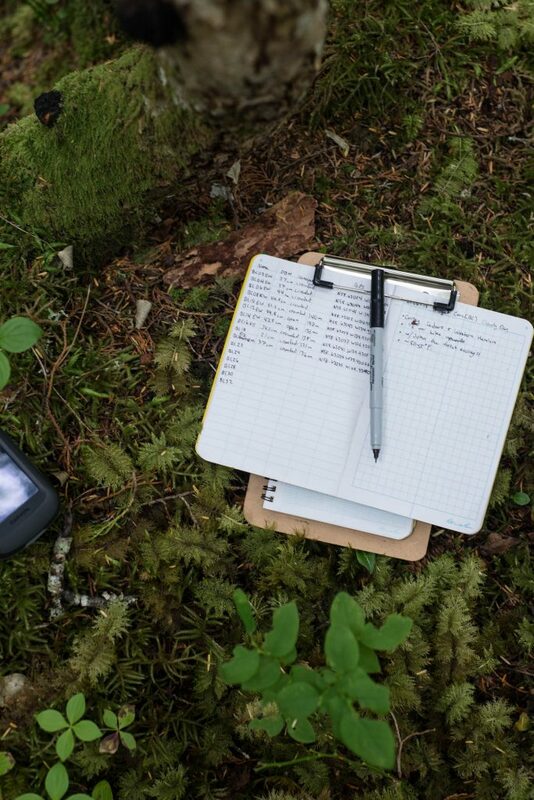 A quick look at one of the group’s field notebooks. John shows us how the ecologists do it! Kerensa cranks out another core. Alora peers into the canopy. A wild Dr. Wiles is spotted from a far. Josh gets his arm workout for the day. Chris and Jesse take a break and find a tree to climb. No trees were harmed in the making of this picture. 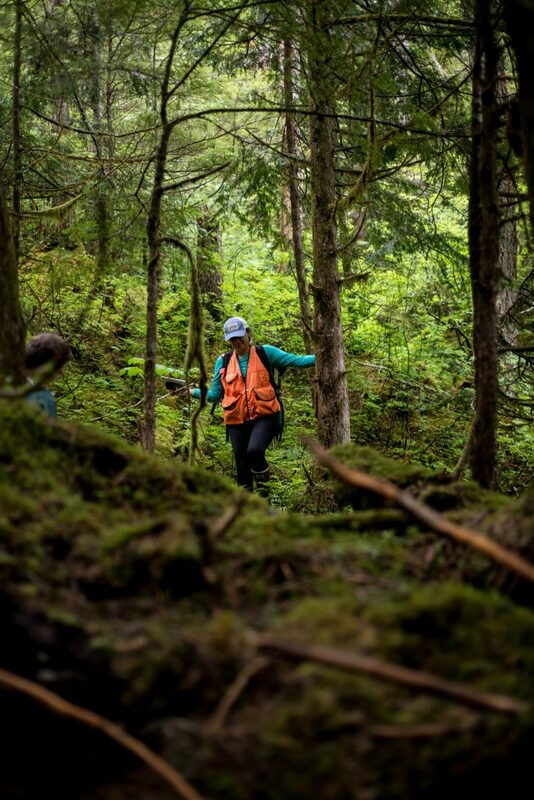 Team Alaska hikes through the woods on a cloudy day to Cedar Lake. At this site they retrieved over 50 increment cores from 25 trees, which will be compared with tree-ring data from Cedar Lake collected in previous years. Lunch included an astounding view of the Pacific Ocean, the misty Chilkat Mountain Range, and some seals! The day ended with another home-cooked meal, followed by some well-earned rest. Malisse is always ready for the camera. 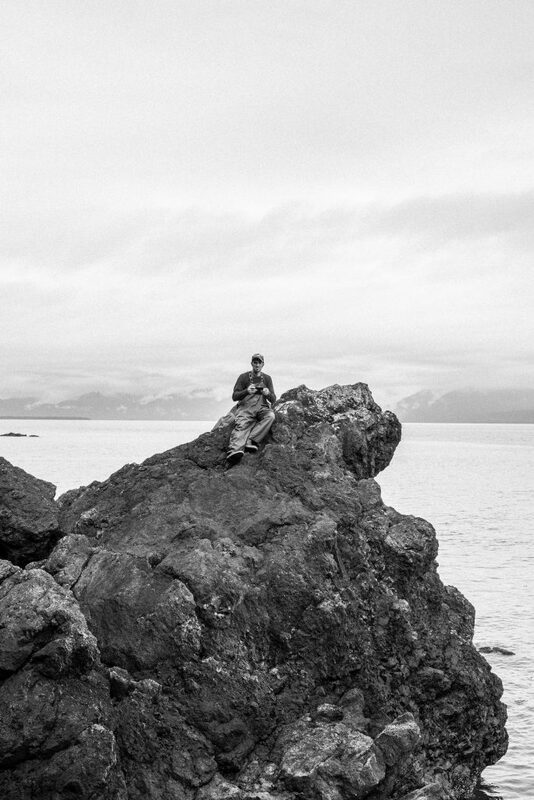 Nick, Wooster’s geology department technician, relaxes on a rocky outcrop for lunch. Nine miles behind him can be seen the expansive Chilkat Mountain Range. 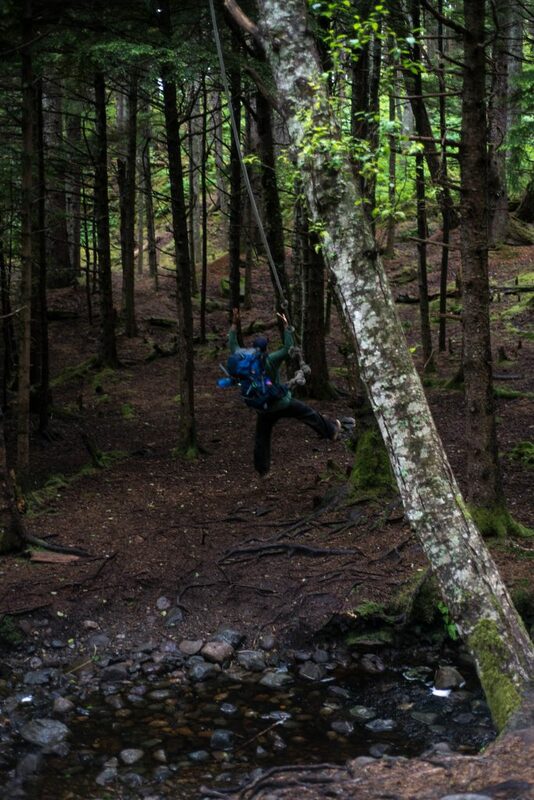 The group finds a rope swing above a creek beside a public-use cabin. Be careful, Chris! 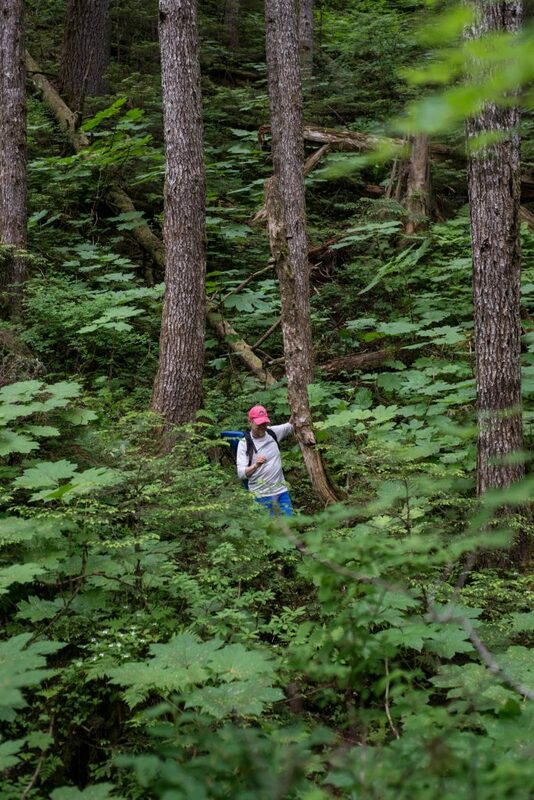 Alora hikes through the temperate rain forest in search of more cedars to core! 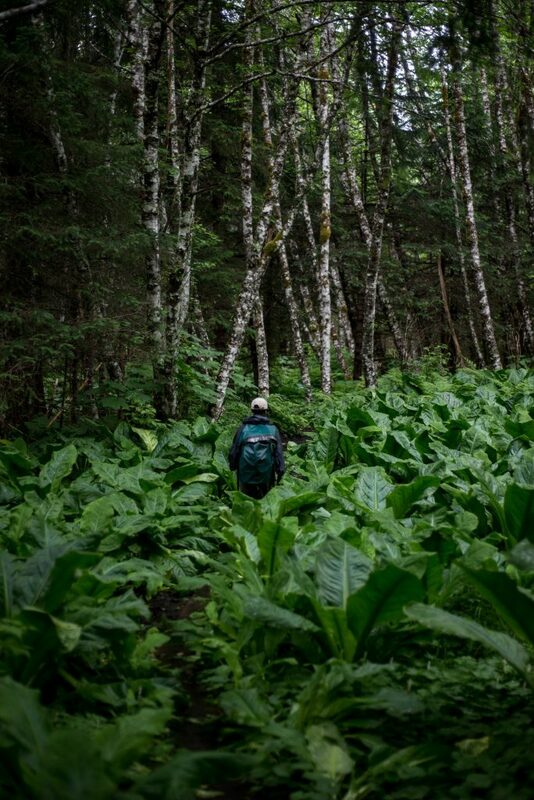 Kerensa wades through skunk cabbage to find the rest of the trail. Team Alaska poses before Cedar Lake; behind them you can see the yellow-cedars waiting to be cored. 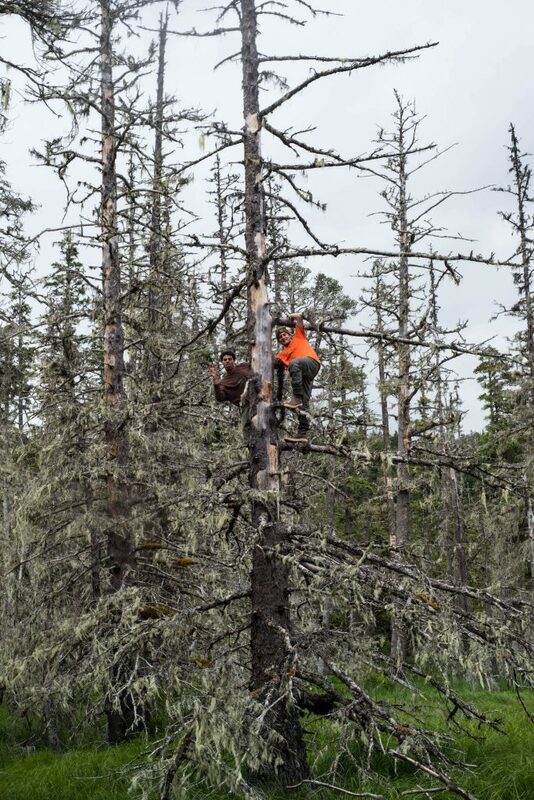 Josh cores high on the tree to avoid sampling a rotted section. Good workout! 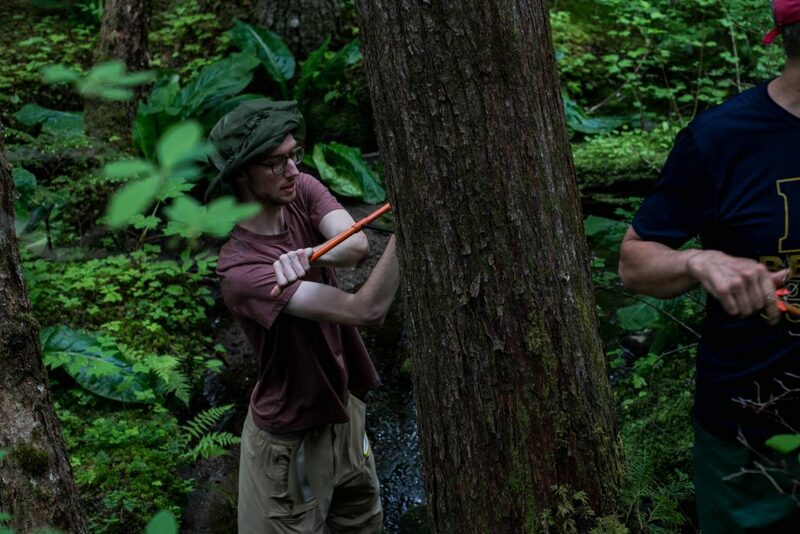 Jesse, Team Alaska’s exceptional photographer, takes his turn coring some trees. Nick and Dr. Wiles compare fresh cores while Alora records data. 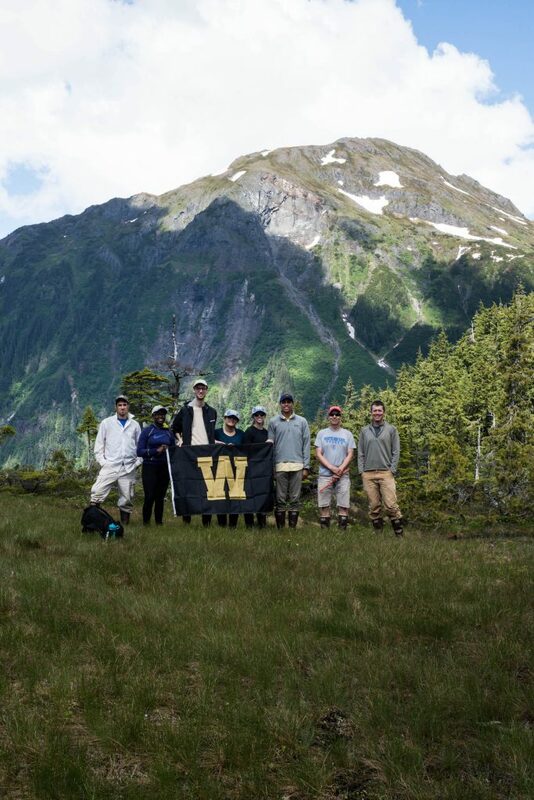 Day one involved team Alaska hiking the East Glacier Trail led by Brian Buma, a forest ecologist from the University of Alaska Southeast. 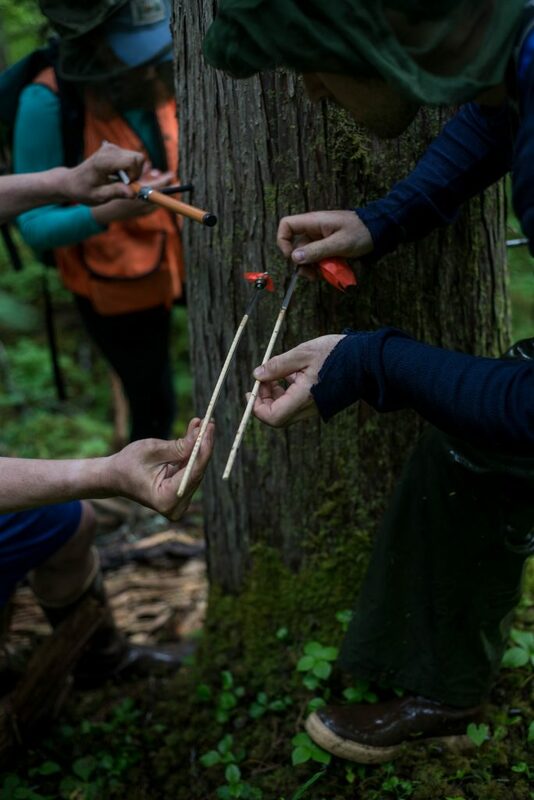 Their goal was to sample yellow-cedar trees at high elevation sites and understand how the dynamics of the forest relate to climate change. The trip was off the beaten path after 2 miles and continued for another 6 miles through a steep, muddy, dense understory. The group only stopped to eat lunch, but it was a sublime day with amazing company. 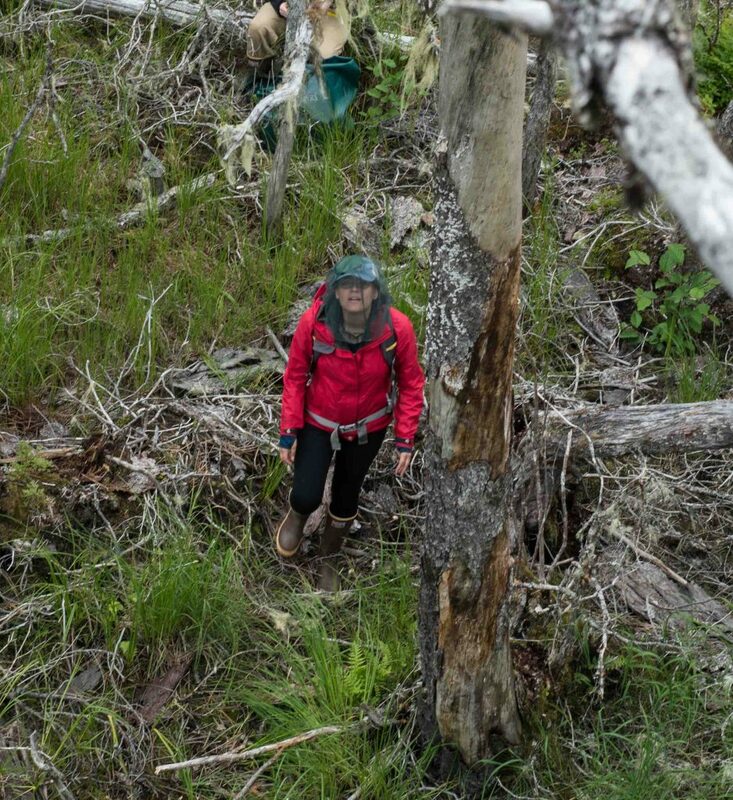 Upwards of 50 samples were collected from a boggy environment, known as a “muskeg”. After a very long but exciting day the group headed down the trail for home-cooked fish tacos. Yum! 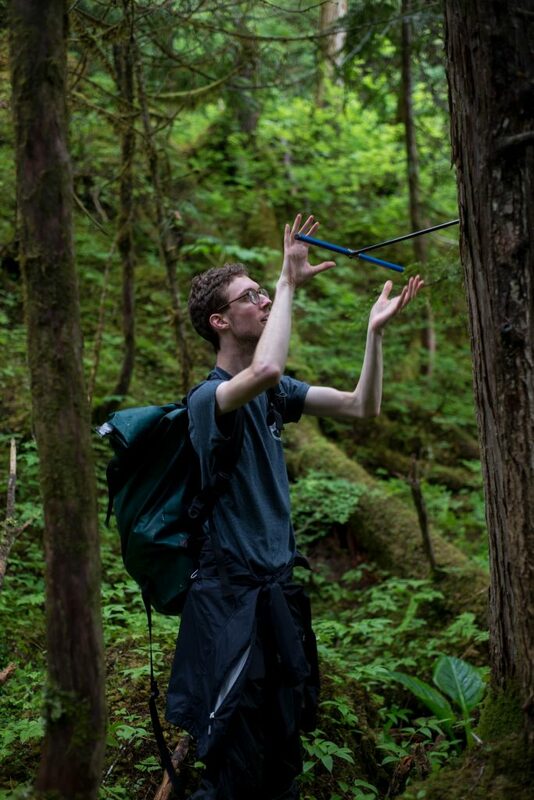 Brian Buma, forest ecologist, gives the group information regarding adolescent cedar trees. The group treks through the unknown terrain, they may be lost. After realizing they were not actually lost Team Alaska catches their breath and admires the views atop the mountain. Chris measures the DBH, diameter at breast height, to assist Brian Bumas’ study of these economically, culturally, and ecologically important trees. 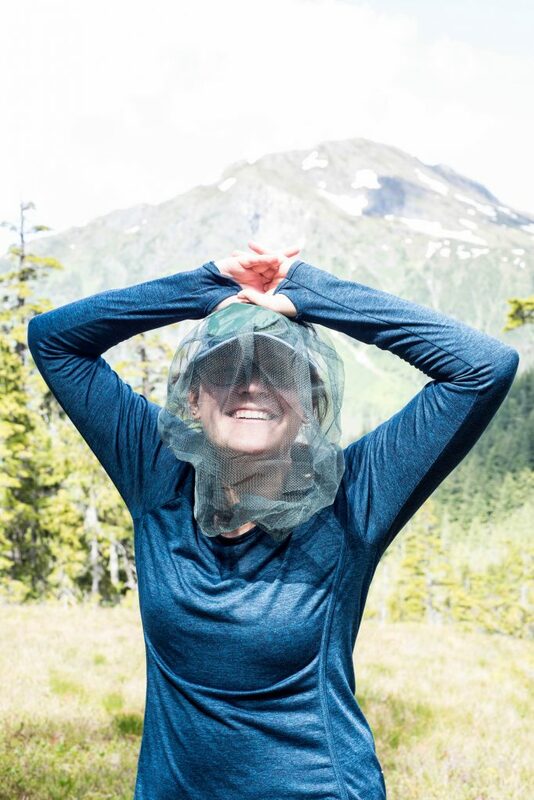 Alora stands in the foreground to upstage the natural beauty of the mountain, it is possible to look good in a bug net! 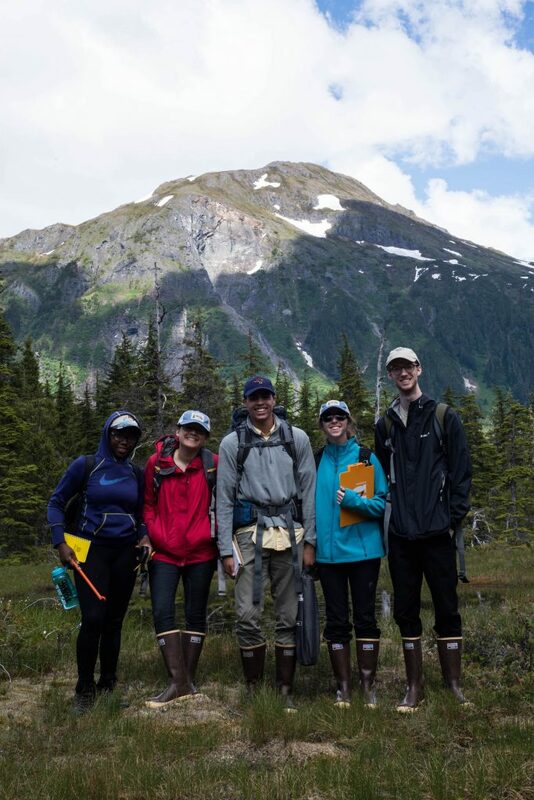 Team Alaska poses for a quick photo-op before starting their fieldwork. 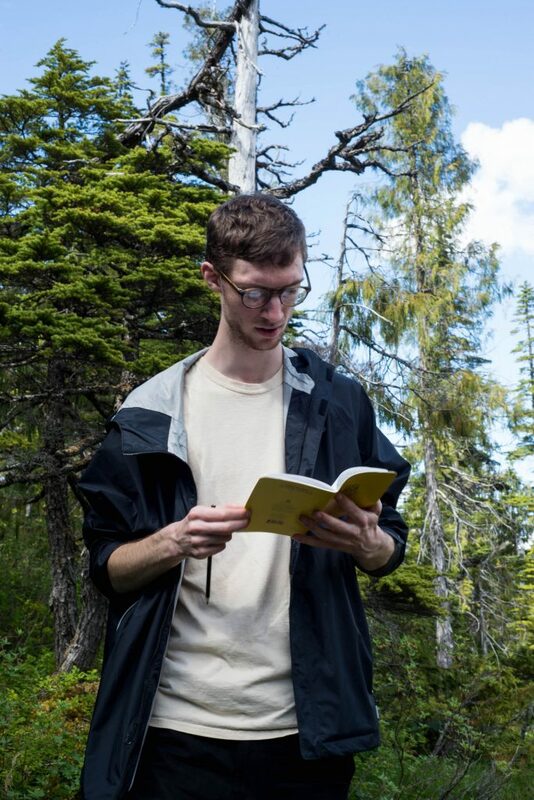 Josh, member of Team Alaska, reads his field notes and records data. 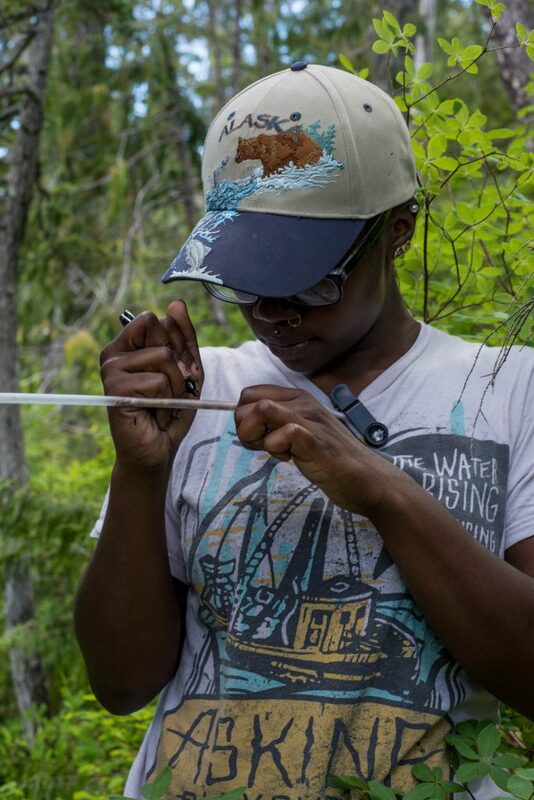 Kerensa labels a straw, containing a yellow-cedar tree core for future analysis. 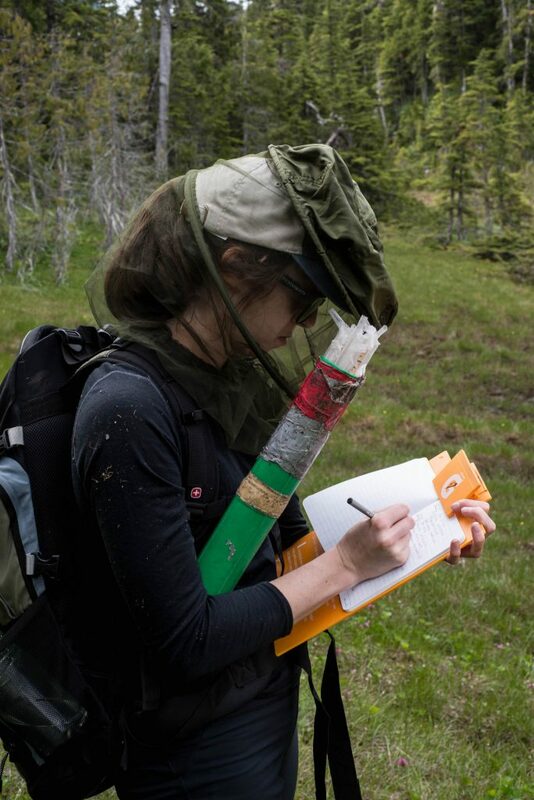 Malisse, renowned multi-tasker, records field notes, holds cedar cores and protects herself from the hordes of insects trying to sample her blood. Thanks to Jesse Wiles for the photographs. The 2017 Keck Gateway Team. 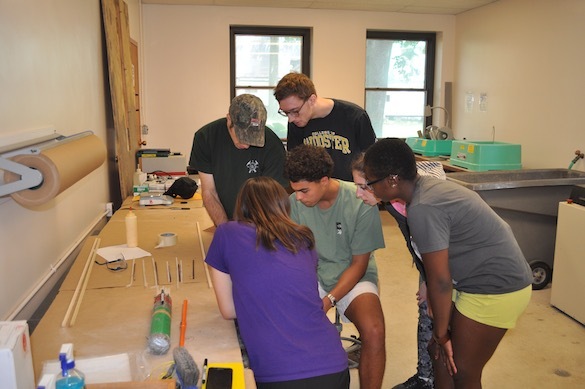 Amid our first official day at the College of Wooster, spirits were high as we embarked on the five week Keck Gateway Project. The Gateway Project encompasses two different scientific enquiries which will span three states; Ohio, Utah, and Alaska. 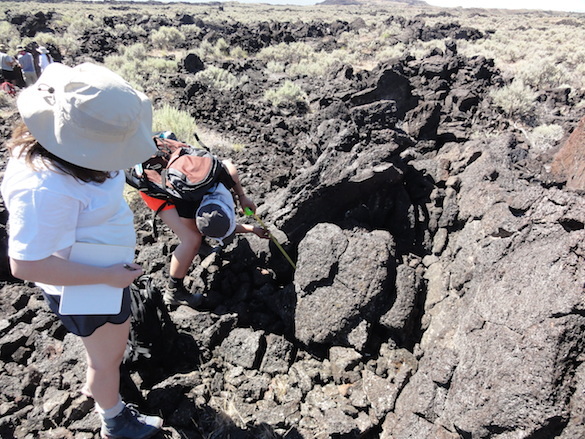 The goal of the project centered in Utah is to determine the age of geologically young lava flows (now igneous rock) in the Ice Springs Volcanic Field of central Utah in order to add another piece to the unsolved puzzle of the Earth’s geologic history. 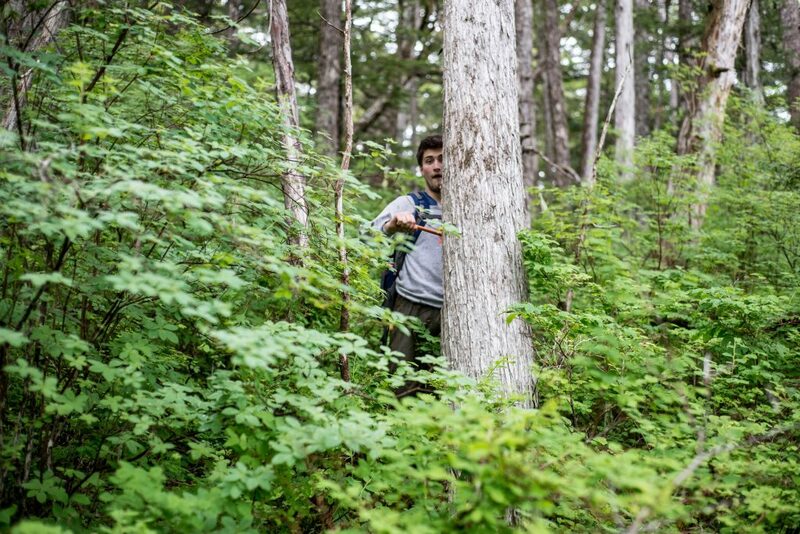 The goal of the project centered in Alaska aims to gain a better idea of why Cedar trees in Juneau are in decline. 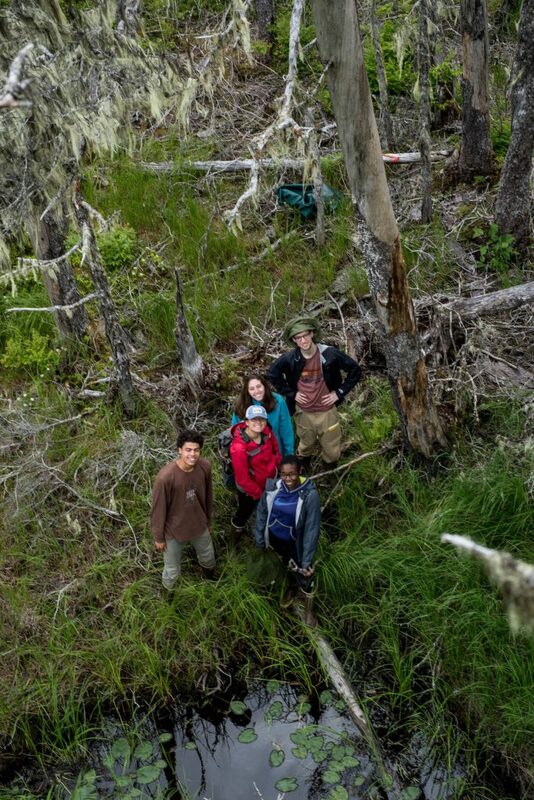 The information gained from the students working in Alaska will help pinpoint specific environmental factors that are adversely affecting ecosystems, trees in particular. This portion of the project is one week long. 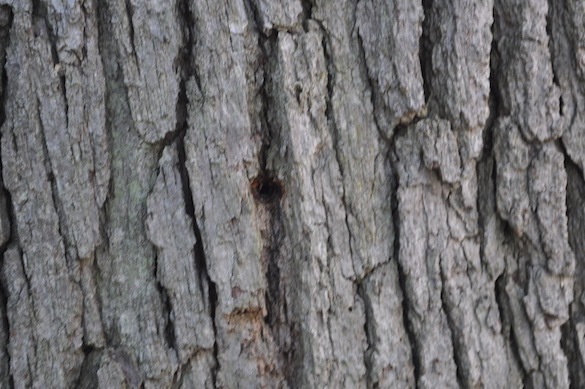 Evidence of a tree core. 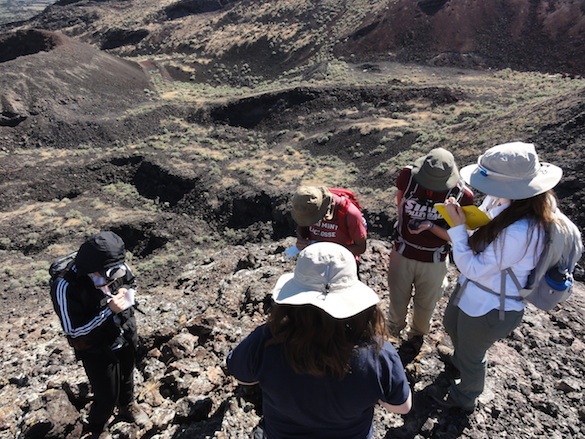 Once the data from the Utah and Alaska field sites are complied, both teams will return to the College of Wooster to complete lab tests in order to answer each respective hypothesis. This portion of the project is roughly three weeks long. 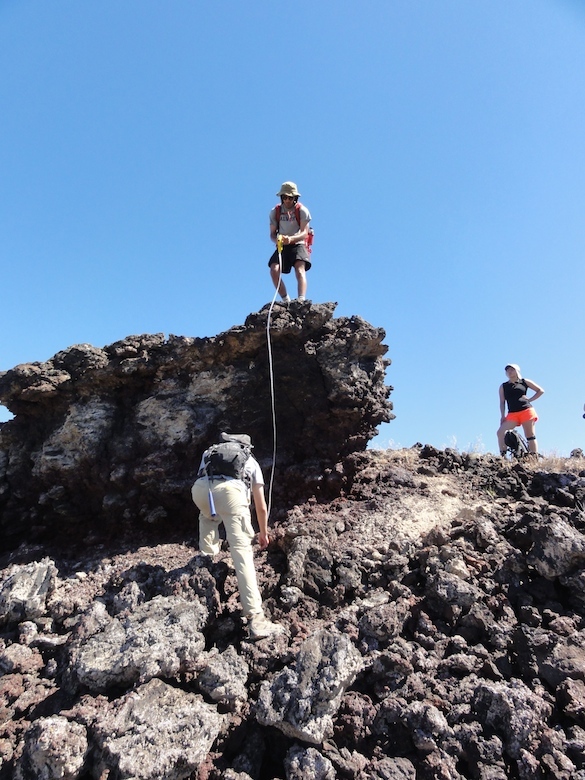 The participants of the project also have the opportunity to attend and present the findings of their research at the GSA’s (Geological Society of America) annual conference in Seattle in mid-October. The first full day of the project was a beautiful one and we dove into the topic material with gusto. We began at 9am in the geology department which is located in Scovel Hall and had a discussion about the rules of authorship and the details of what mentoring means with Dr. Pollock and Dr. Wiles. 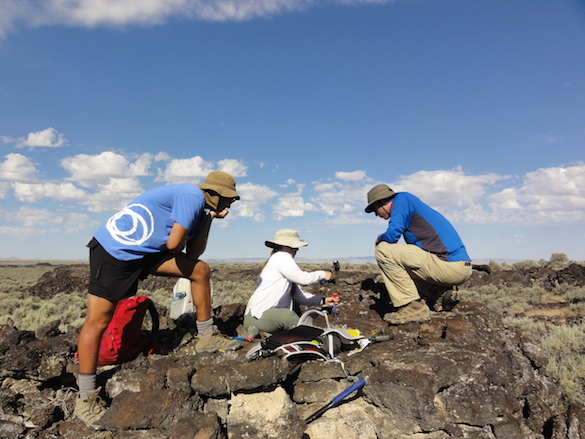 Following that, details for the field work trips (Utah and Alaska) were coordinated and supplies like rock hammers and chisels were evenly distributed. At that point it was time to break for a much needed lunch. 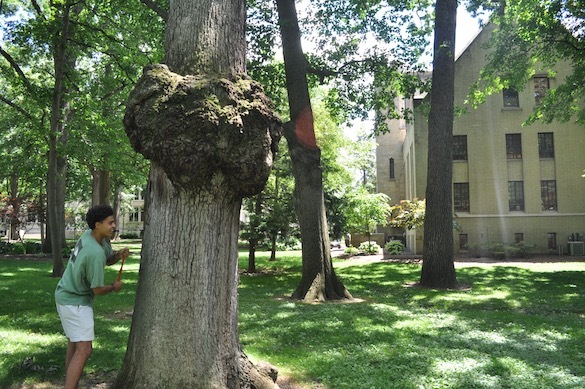 The Keck group met back at Scovel Hall around 1:30, just in time for a jaunt around the Oak grove led by Dr. Wiles, during which the group cored three trees to determine their age. 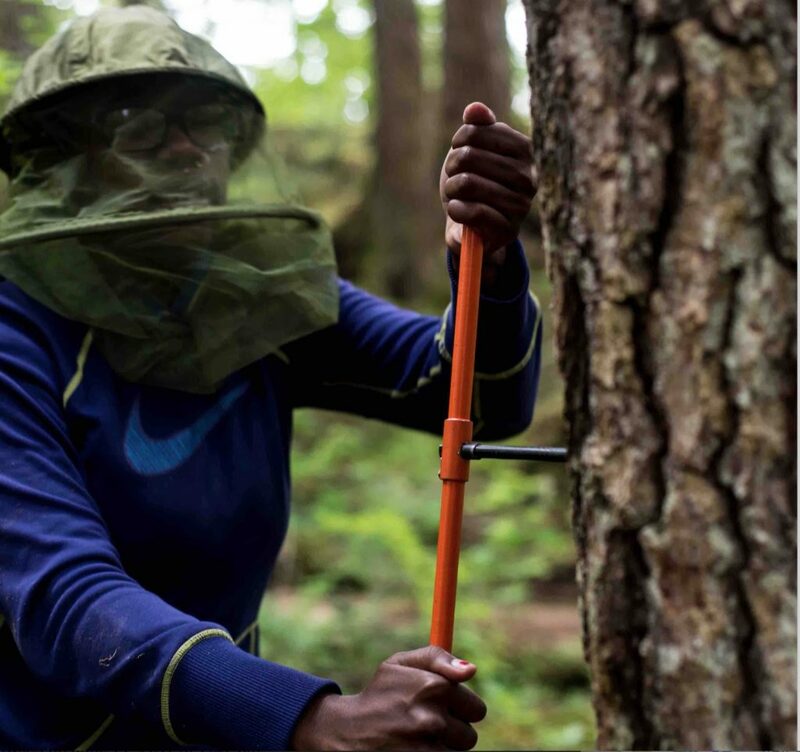 The processing of coring trees involves inserting a hollow drill into the tree, then removing the sample of the tree located in the hollow drill. 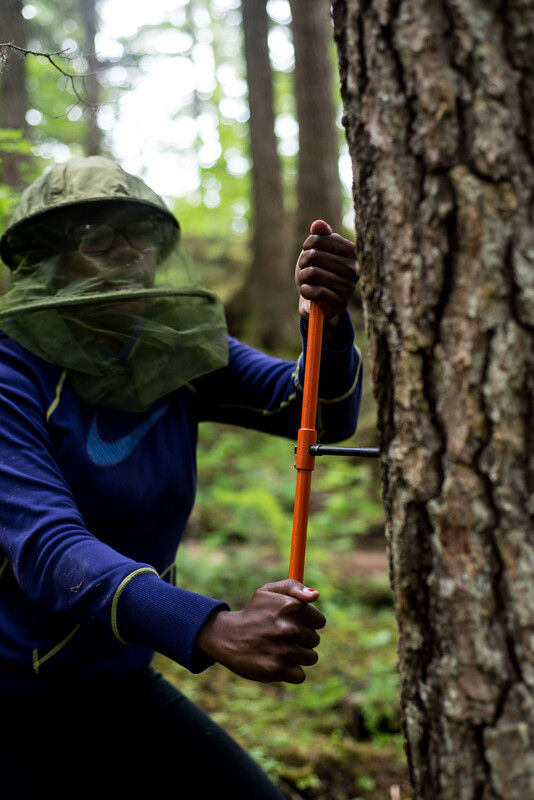 An excited Team Alaska member extracts her tree core. 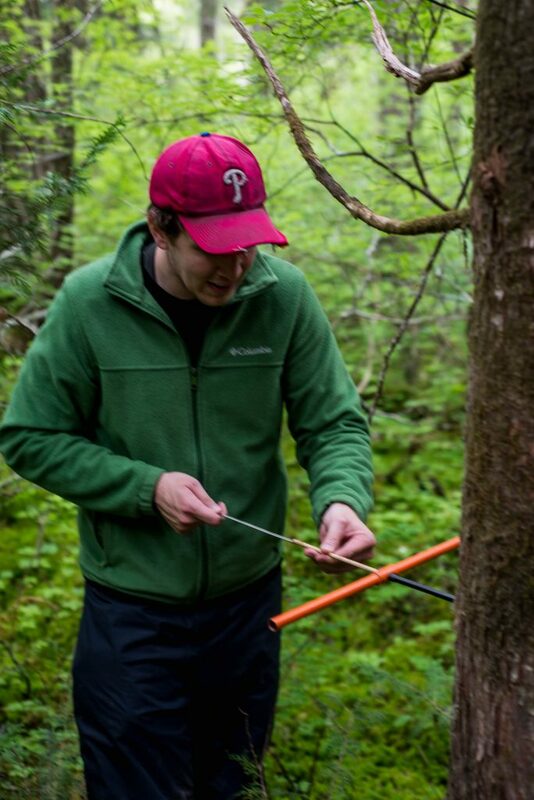 The Alaska team will use this method hundreds of times in order to determine the health of trees in a large area. 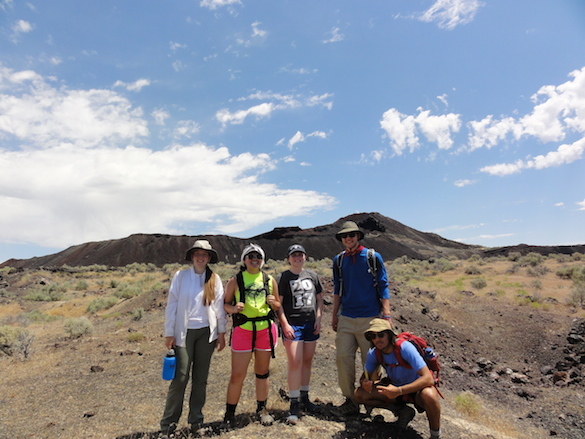 With the first day complete, our group looks forward to strengthening our bonds and embarking on our geology research. On the second day, the Utah group and the Alaska group split to their respective labs to discuss the minutia of the trips. 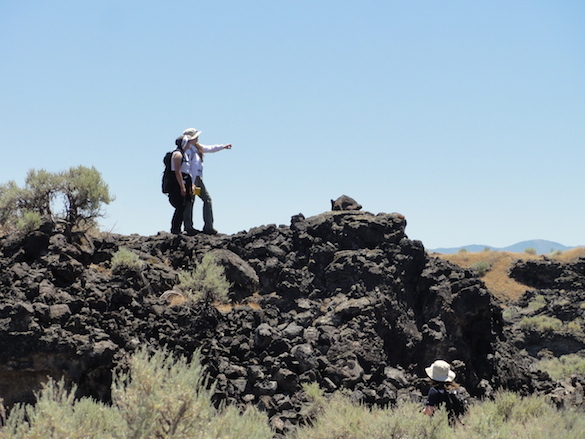 The Utah group examined basaltic rocks from the Black Rock Desert, the location where they will be conducting their fieldwork. 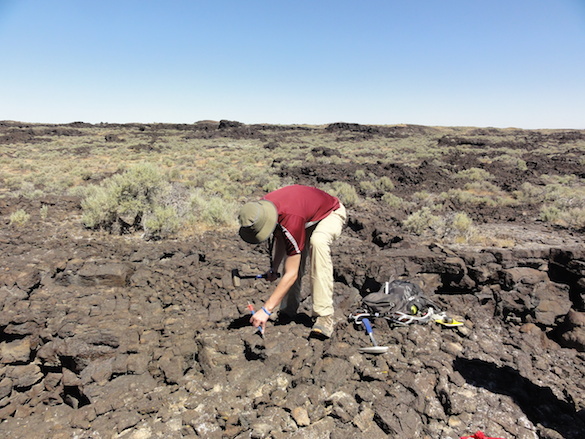 These rocks had previously been dated via two techniques: one being Varnish Microlamination (VML) which aims to date the rocks by measuring the coating on rock surfaces, the other being Cosmogenic Nuclide Dating which measures the accumulation of radioactive isotopes in the surfaces of the lava flows. 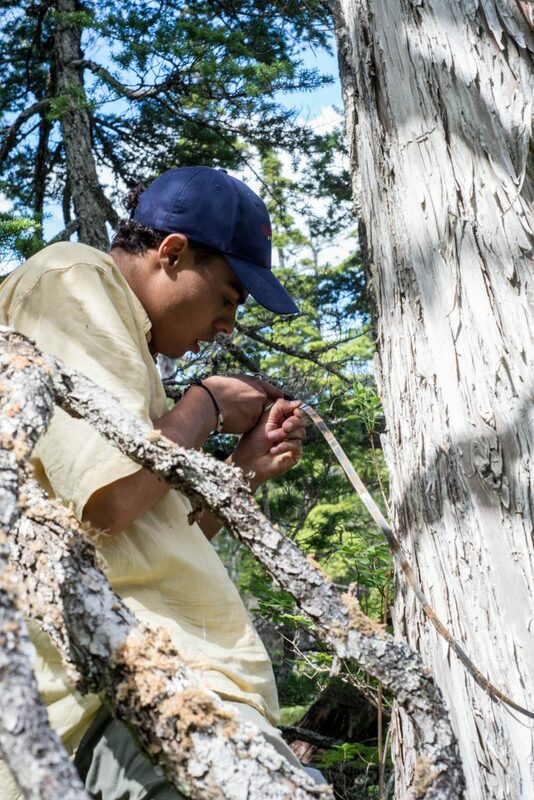 Meanwhile the Alaska group learned more about tree coring, a practice they will become very familiar with during their stay in the last frontier. This concluded our work for the day, and we broke for lunch. The rest of the day was spent preparing for our arduous journeys to the field sites the following morning. We went shopping to stock up on various items for the trips. 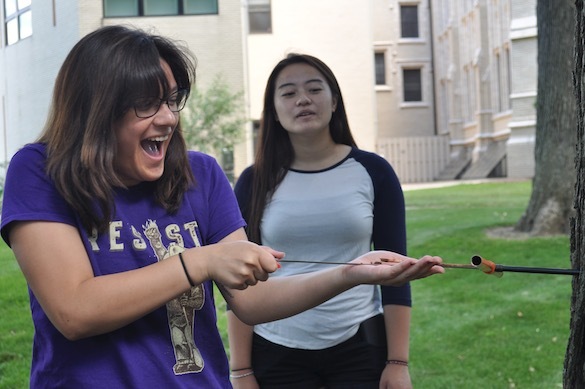 The day came to a conclusion with a delicious dinner and some frisbee outside Douglas Hall. 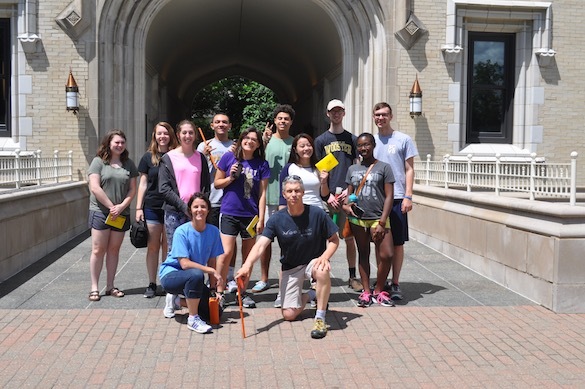 Much to their chagrin, the Alaska group was departing the College of Wooster at 4am on the third day. The Utah group was given a more lenient departure time, 6am, because their destination was 2,113 miles closer to the College. There were no issues rising bright and early and both groups headed to Cleveland Hopkins Airport with anticipation of the journey ahead of them and slightly weary eyes. To make matters more interesting for the Alaska group, their travel plans routed them through Dallas Fort Worth…not quite in their desired direction but they were sports nonetheless. And so the day went, a travel day. The Utah group touched down in Salt Lake City in the mid afternoon and began the two hour drive to the town of Fillmore, only stopping once for a much needed dinner. Eventually the group made it to their campground and settled in their cozy cabins. After a long day of travel and two hours lost, a rest is what the doctor ordered. As of writing this, the Alaska group is currently still in transit to Juneau. 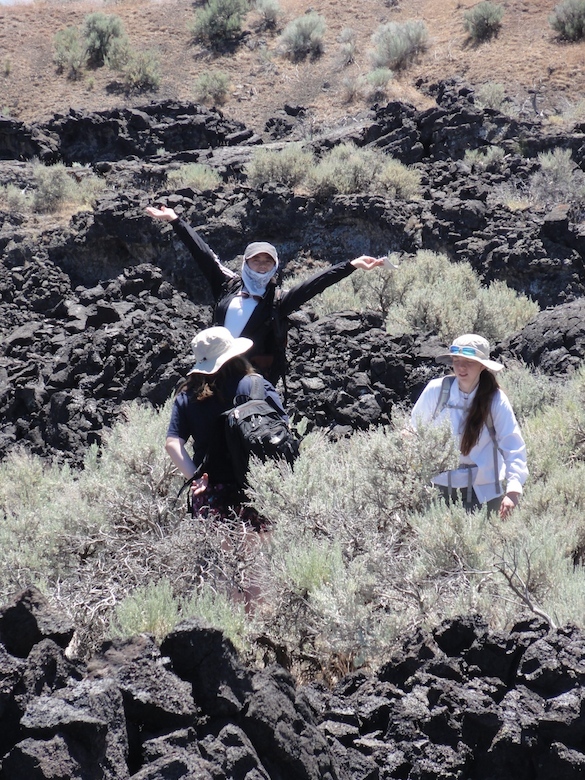 Tomorrow marks the first official day of field work in the Black Rock Desert for the Utah group and there is an excited fervor hanging in the air. All the tools and measurement devices are prepped and ready to go. 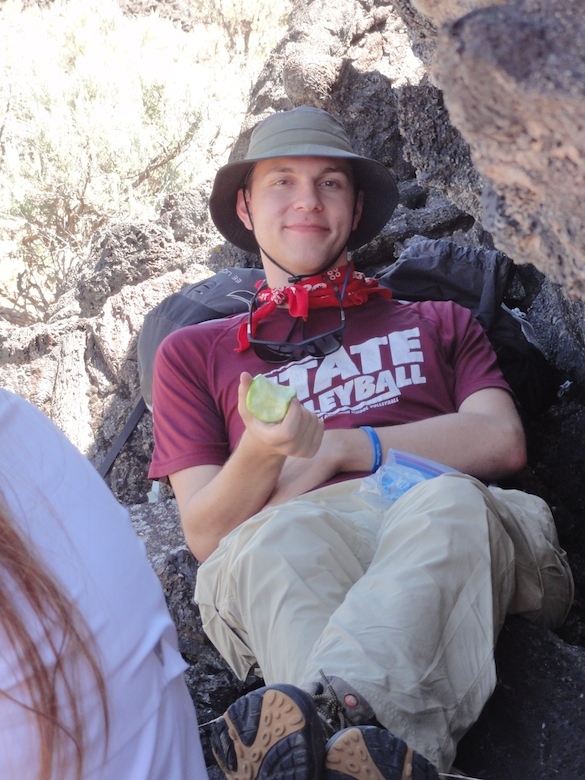 Berkeley, California — Brandon Bell (’18) is a double major in geology and history at Wooster. He has a classic double-major thesis that combines both disciplines: the early history of modern seismology following the Great San Francisco Earthquake in 1906. He is focused on the growing international communications among scientists about earthquakes, especially between Japan and the United States. Brandon thus is studying the geology of earthquakes as well as original documents generated through these international discussions. Brandon received Copeland Funding from the college to visit the Bay Area of northern California to work in the libraries and visit the San Andreas fault itself. 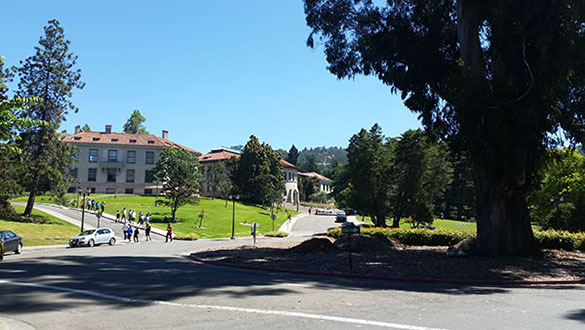 The above image is of the beautiful University of California campus in Berkeley. Brandon has his own detailed and illustrated blog describing his adventures. Check it out! He is still adding to it. Special thanks to Dr. Peter Roopnarine at the California Academy of Sciences for meeting with Brandon and adding to his knowledge and experiences. 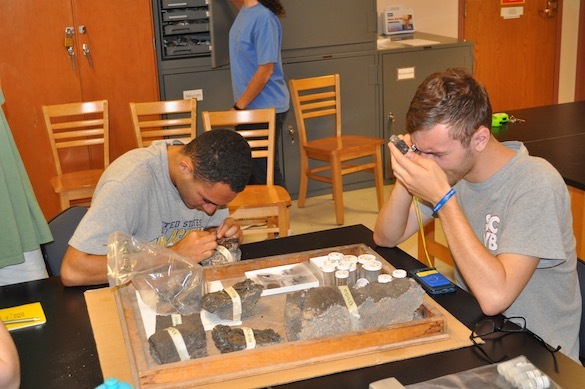 July 19: Meanwhile, what are the Wooster Paleontologists up to? 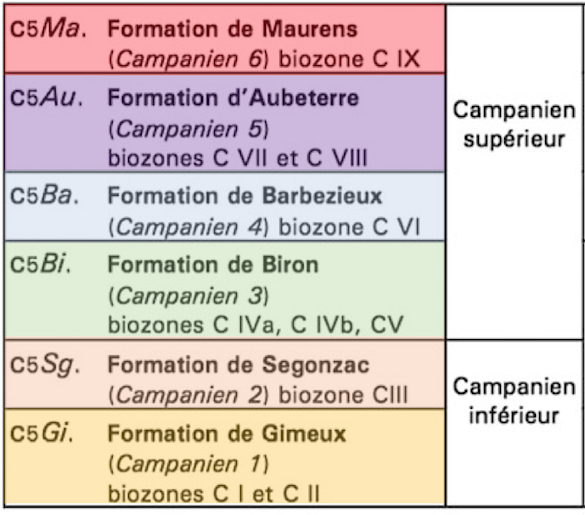 The above stratigraphic chart, courtesy of Platel (1999) via Paul Taylor, shows the three Campanian (Upper Cretaceous) units studied in southwestern France: The Biron, Barbezieux, and Aubeterre Formations. 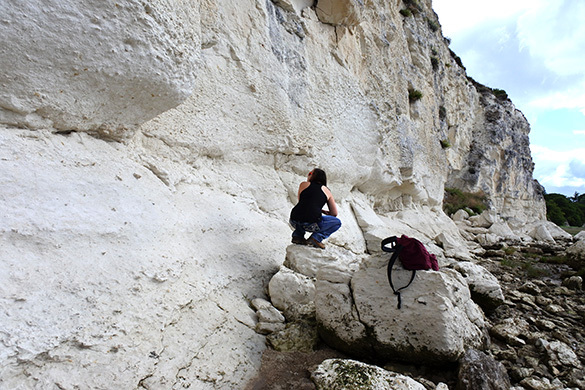 Here is Macy at Caillaud with the very white, chalky and fossiliferous Biron Formation. The succeeding Barbezieux and Aubeterre formations look pretty much the same! 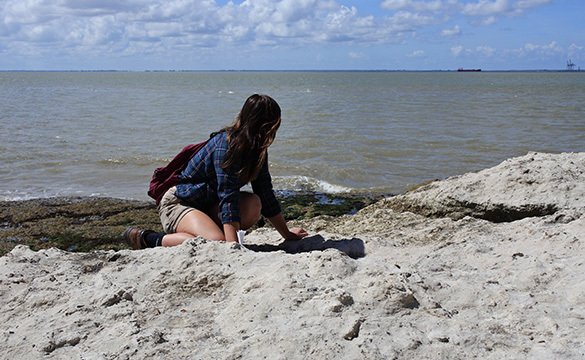 Since it was Europe, there were plenty of cultural delights, some with useful outcrops immediately at hand. Please check out the posts linked above, or follow the tags “Austria” and “France”. 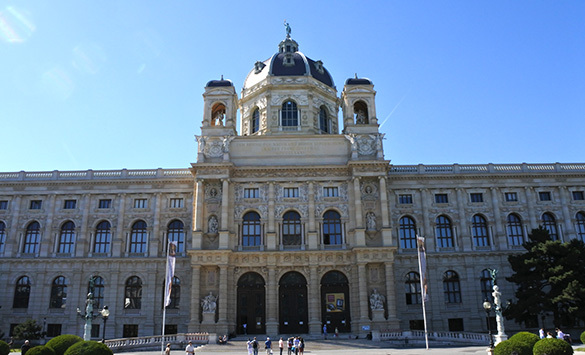 The Natural History Museum in Vienna. 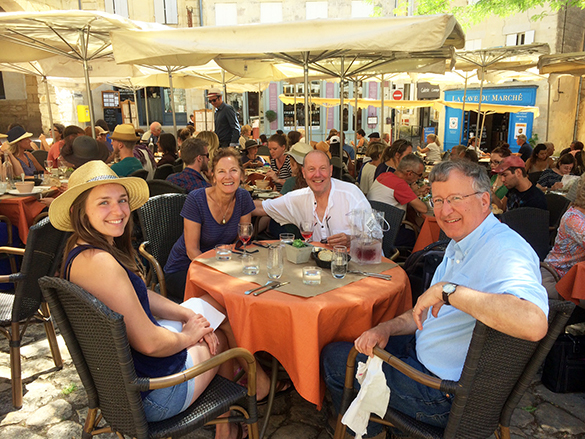 La Barde, France — On our last full day in southwestern France, Independent Study student Macy Conrad (’18) and I had a cultural visit with our host Paul and Patricia Taylor to the ancient town of Saint-Émilion. 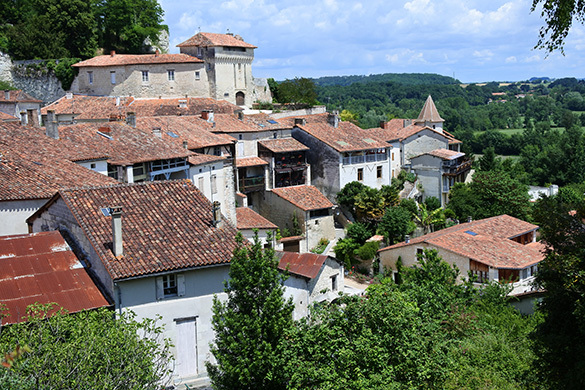 This town, set in a place that has been inhabited for millenia, is a World Heritage site amidst extensive vineyards and wineries. It has many architectural and historical treasures, which we could only touch upon during our short visit. 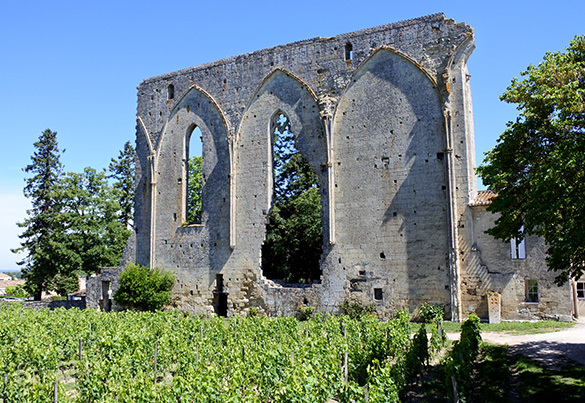 This wall is all that remains of a 13th-Century monastery demolished in 1337. It is referred to as the “Great Wall”. 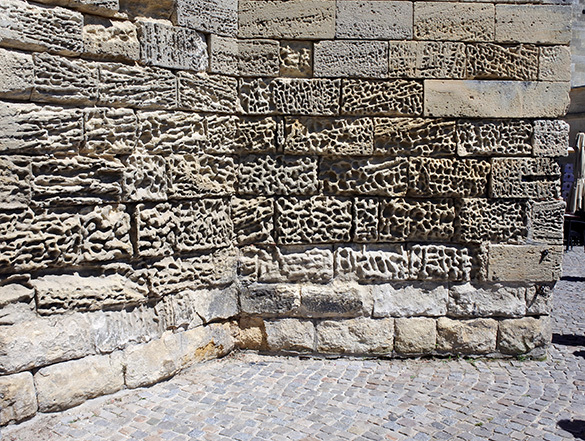 The building stones in this wall and most of the town itself are Oligocene limestones, some rich with fossil fragments. The interior of the Collegiate Church, a mix of Romanesque and Gothic architecture. 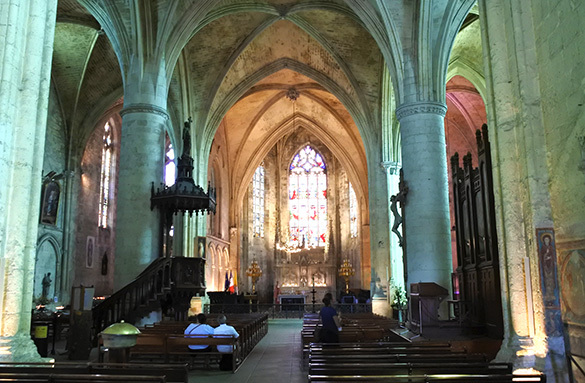 12th-Century frescoes still survive in the Collegiate Church of Saint-Émilion. This set shows the grisly story of Saint Catherine. 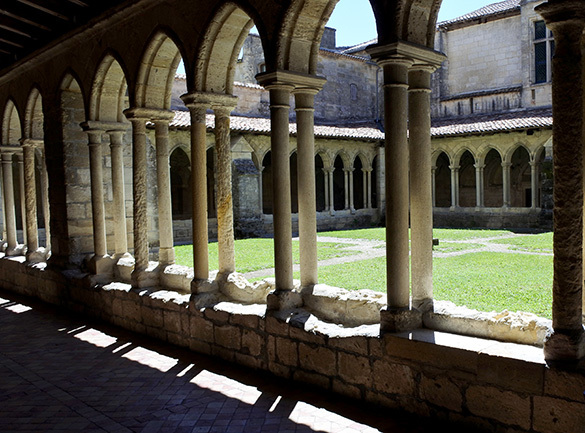 The cloisters of the Collegiate Church. Imagine the characters who walked through these passages, from Crusaders of the 12th Century to occupying German soldiers of the 20th. 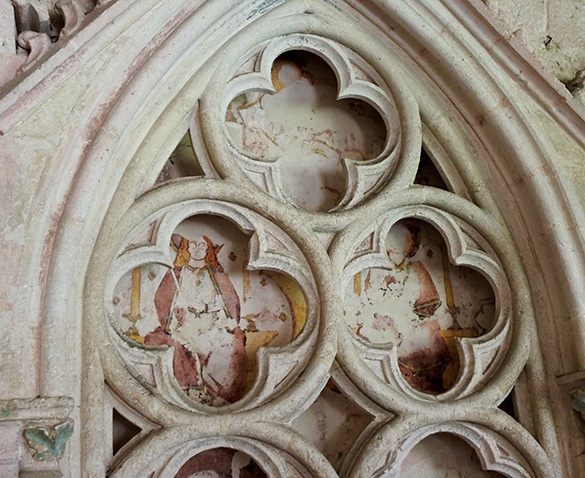 More 13th century frescoes in the cloisters. The building stones show magnificent weathering over the last 700 years or so. 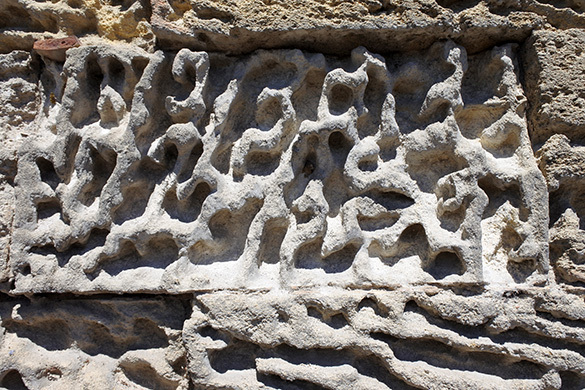 The most elaborate weathering accentuates burrow systems in the Oligocene limestones. Later building stones in other regions were actually carved to show apparent weathering patterns like these. Our lunch view. 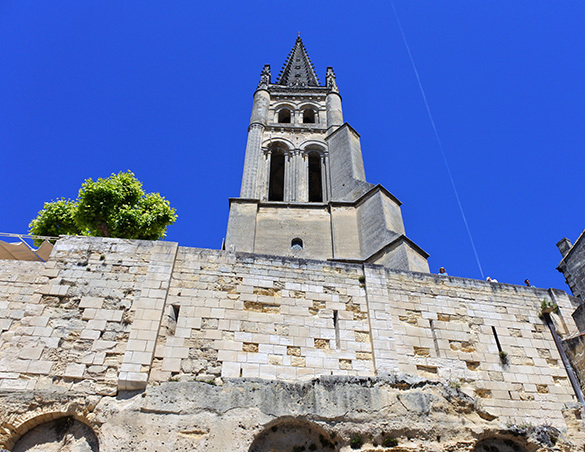 The bell tower is for a church carved into the limestone below. This is another underground church like the one we visited in Aubeterre. Our lunch in Saint-Émiliion. Yes, fieldwork is tough in southwestern France. Macy Conrad (’18) is on the left, with Patricia and Paul Taylor and then me. 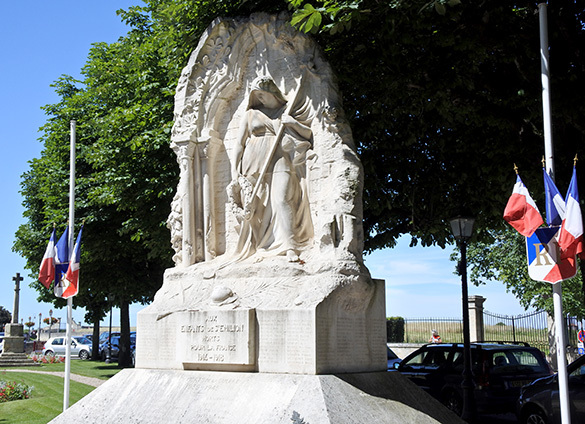 I want to add an image of the war memorial in Saint-Émilion. 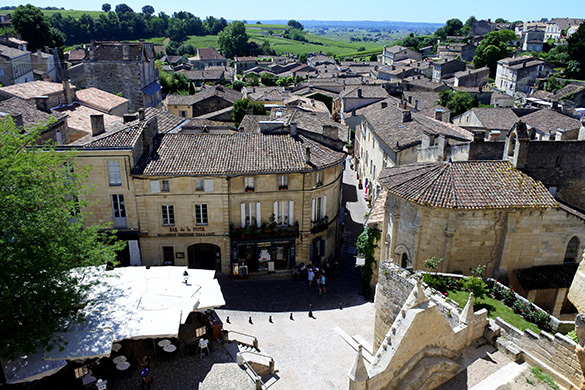 Every French village, town and city has at least one. They were erected after World War I and usually inscribed with hundreds of names. The World War II local dead are often inscribed later on the bases. 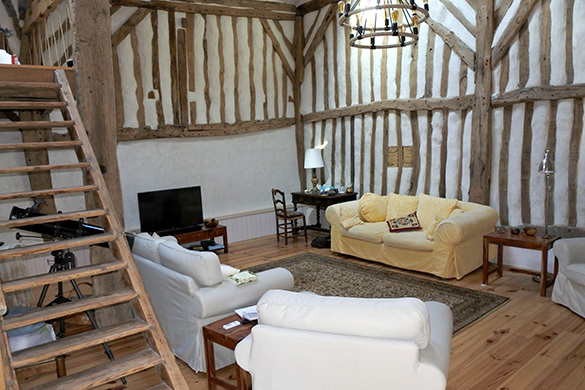 Finally, a few images from our delightful lodgings in the Taylor home at Bard’s End, La Barde. 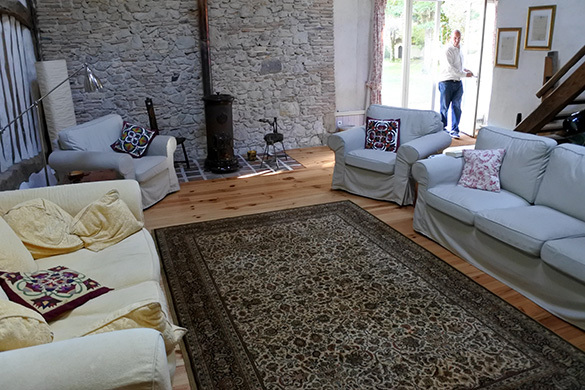 This is the lounge, which held livestock when this was a farmhouse in the 19th and 20th centuries. The lounge from the other side, with Paul Taylor entering from outside. The multi-talented Macy was a great help to the Taylors as they assembled a set of furniture from Ikea. 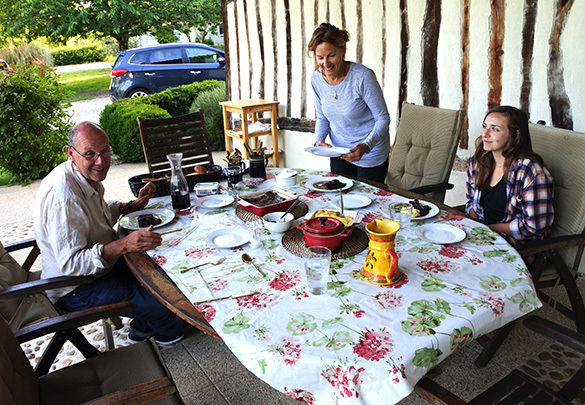 All our dinners were outside on the patio facing the River Dronne. Delightful! Thank you again to Paul and Patricia Taylor for making this research expedition such a success and pleasure. We will report our results in later posts! Macy and I leave tomorrow morning on a long train trip to Paris. I then fly home and Macy continues her European adventure with a visit to friends in Norway. Team France is done with fieldwork. The extensive labwork begins this summer with our specimens.